NEW YORK (CelebrityAccess MediaWire) — In a surprise move, Eddie Van Halen has selected his 15-year-old son Wolfgang as Van Halen's new bassist. According to Billboard, Wolfgang will replace Michael Anthony who has departed from the group with little public explanation. While there has been no official statement about Anthony's departure, there have been signs of friction between the Van Halen brothers and Anthony. 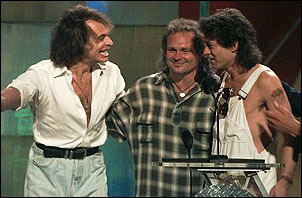 On a Sept. appearance on 'The Howard Stern Show', Anthony told listeners that "I got no problem with these guys, but they're billing themselves as the other half of Van Halen. My brother is the other half of Van Halen. They're out there selling hot sauce and tequila and playing all my songs. It doesn't bother me. It just makes them a cover band." Van Halen has been rehearsing for a 2007 tour, but the lineup has not yet been set in stone. Presently, it consists of Eddie Van Halen on guitar, his son Wolfgang on bass and Alex Van Halen on drums. No announcement has been made about who will be on vocals but rumors continue to suggest that David Lee Roth will return to lend his distinctive voice to the project. "I see it absolutely as an inevitability," Roth told Billboard with remarkable clarity "To me, it's not rocket surgery. It's very simple to put together. And as far as hurt feelings and water under the dam, like what's-her-name says to what's-her-name at the end of the movie Chicago — So what? It's showbiz! So I definitely see it happening."